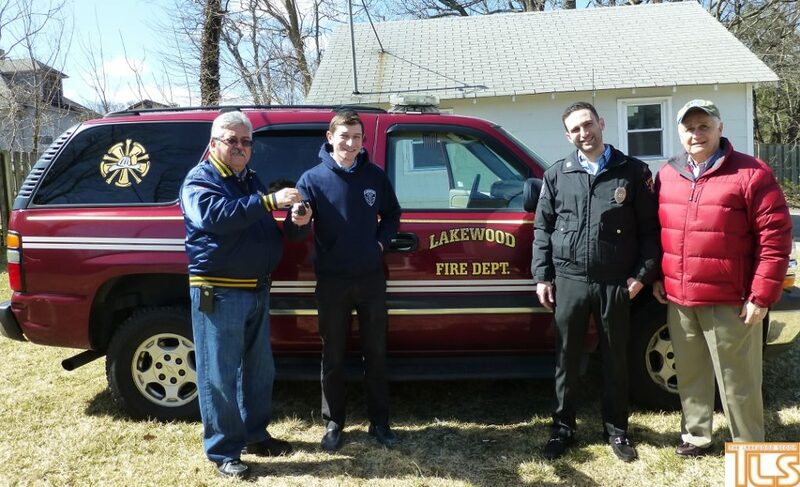 The Lakewood First Aid today received an old Fire Chief’s vehicle as a donation to their volunteer squad. “The vehicle will be used as a medical emergency first responder vehicle, which will benefit the rresidents of our town who rely on us for a prompt response in the time of a medical emergency,” says Moe Heinemann, Captain of Lakewood First Aid. “We are very grateful to the Board of Fire Commissioners who have chosen to donate this vehicle to us, as we solely operate and rely on donations,” Heinemann says. The Squad President, Yehuda Shvartzblatt tells TLS the squad has been in need of a new first responder for quite some time, but was unable to purchase one due to lack of funds. “We cherish the great working relationship we have with the Lakewood Fire Dept and Board of Fire Commissioners and we are very thankful to them,” says Shvartzblatt. Presenting the vehicle and handing over the keys today to Heinemann and Shvartzblatt, were Fire Commissioners Mike D’Elia, and Juan Ortiz. The vehicle will require some mechanical work and repainting and lettering before being put into service.